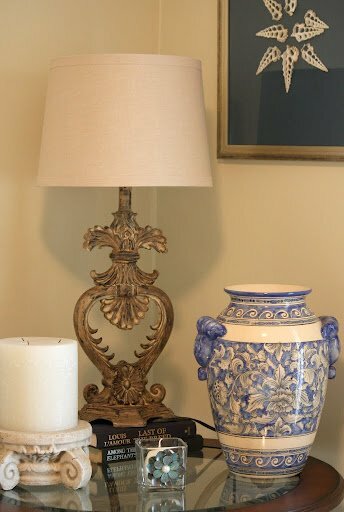 For more than a year now, I have been transforming my trash to treasure projects and furniture pieces with a beautiful faux plaster paint finish technique. I stumbled on this process by mixing a certain ratio of flat paint and lightweight spackle. 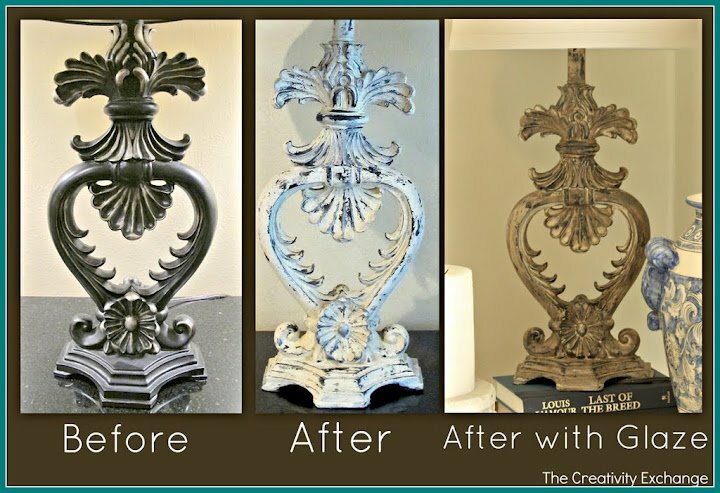 This is a really quick way to update old junk and dated furniture pieces in a big way. 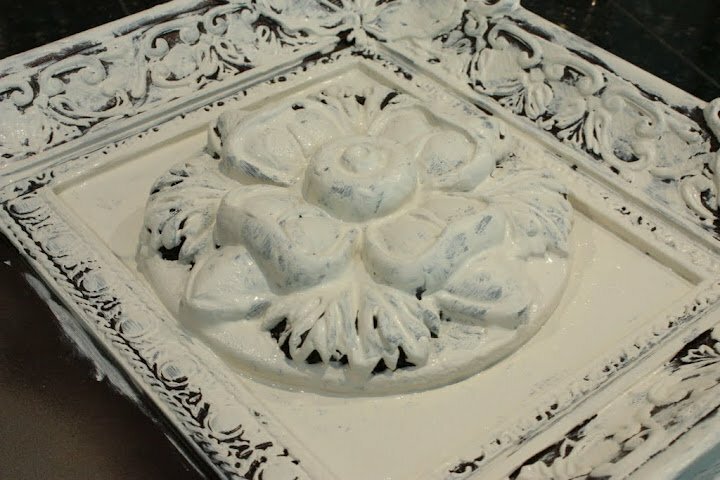 This technique also works perfectly to create a gorgeous chalk paint finish by reducing the amount of spackle in the mix and adding a small amount of primer. 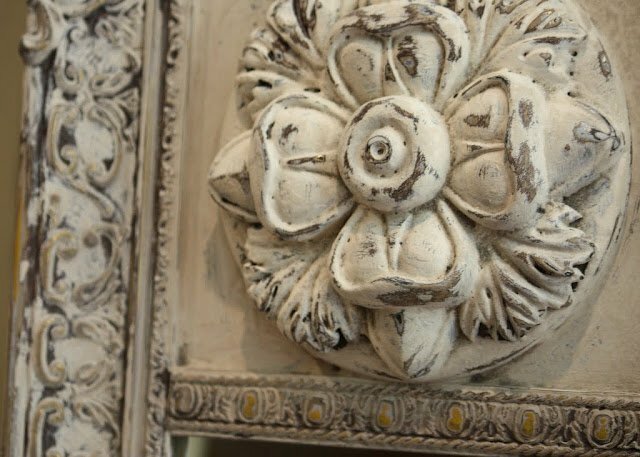 These finishes have a thick plaster/cement chippy like look that can be darkened up with a little brown, black or gray glaze, or they can be left alone and finished in a off white plaster finish- with a dark under color, adding depth. I will go into the instructions at the end of the post but in the mean time, let me show you some before and after pictures of how you can dramatically transform old junk with this technique. Ok, so let’s get to the easy instructions. 1) You can use this paint finish on pretty much anything including accessories, furniture, wood, metal, glass, ect… The first thing to do is to figure out what color you want as an under color to show through. I spray painted the frame mirror with a brown satin spray paint and let it dry completely. For my lamp revamp, the lamp was already black, which was the perfect under color and I did not prime it. 3) Once the spackle/paint is thoroughly mixed together (I use a spoon), I brush it on with a foam brush. The foam brush gets more of the plaster mix onto the item, rather than a standard brush. The foam brush also allows a little more control. It also looks good to sporadically brush on thick areas of the plaster and alternate with thin areas of the mix as well. Don’t worry about brushing it on to look blended because you will blend it all in when you sand . I really just sort of slap it on here and there and leaving areas unpainted. Also, the plaster mix consistency is really like paint, maybe a little thicker but when it dries, it really gets thick and chalky! You can also control the thickness of your faux plaster by reducing or increasing the spackle ratio but I have found 50/50 has worked best for my projects. If you want areas thicker, just slap on more mix! 4) Allow the plaster mix to completely dry. Overnight is usually just right. I sporadically sand areas down to my under color and in some areas I will sand down beyond my under color and into to the wood. With coarse sand paper it does not take long to go around and sand areas or use the wire brush. My goal with the sand paper is to blend the plaster at the areas where I stopped and started my brushing on of the plaster, to make it look more natural. You can see above that in some areas I also sanded down to the original gold. 6) You will just have to play with the sanding and steel wool to get the combination and the look that you like. Some areas of dried plaster I didn’t touch and other areas I either lightly sanded or rubbed the sand paper into the piece enough that sanded the plaster completely off. For adding glaze to the top of your plaster, you can find antiquing glaze in brown, black or gray at the craft store. Just pour a small amount of glaze onto a white rag or old torn t-shirt and “pat” the glaze into the plaster and sporadically around. If you get to much glaze on an area, you can remove by patting the area with a dry rag. Be sure and leave some areas white to keep that plaster look. 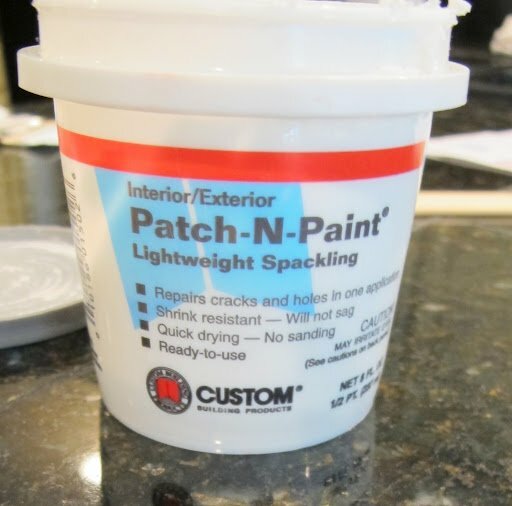 If you are interested in the paint combination for making a chalk paint finish for furniture revamps using spackle, I use a ratio of 1/3 flat paint, 1/3 cheap primer and 1/3 spackle mixed together. 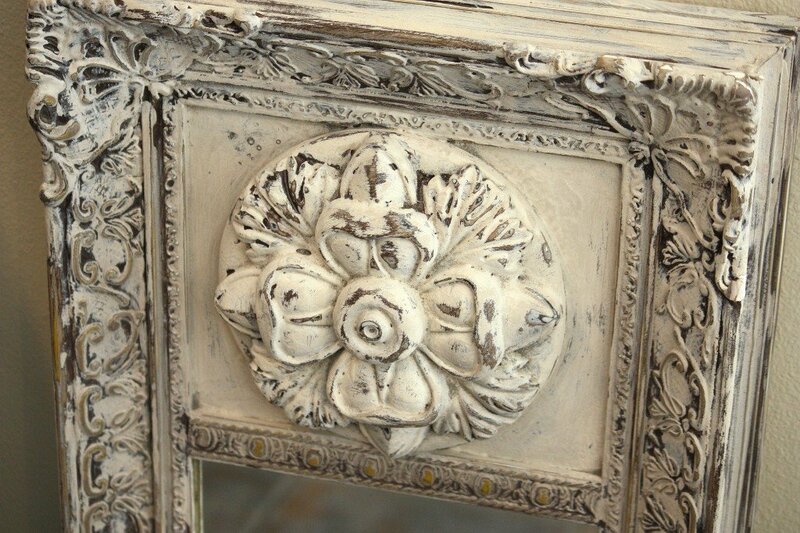 It works beautifully and has the same chalk paint finish as the expensive chalk paints! Well once again, I have written a novel here! Ugh! Oh well, I hope you have more details than needed if you decide to give this a try! 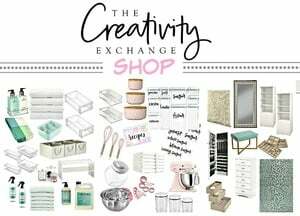 There are so many possibilities and this process is so easy even though I made it so long! Completely gorgeous! What a wonderful tutorial too. That tiger has new stripes now. OMG, it looks like a million bucks now!! What a super transformation!! ms around the house for a makeover. Thank you!!! This is a great idea Cyndy! 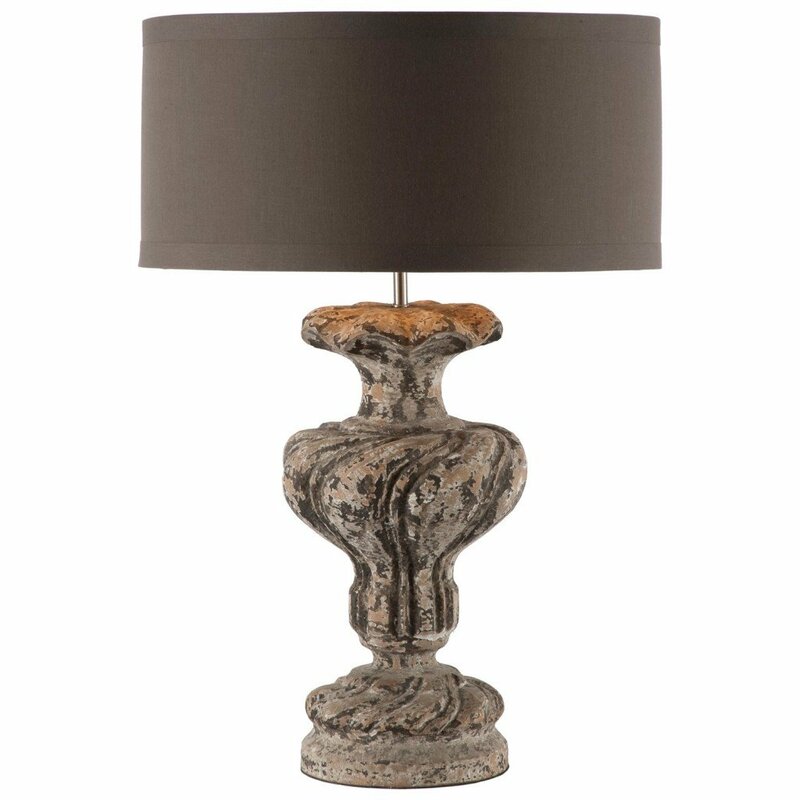 I LOVE Aiden Gray lamps, but not the price! This is a great alternative. Thank you girl! I forgot to mention that I did this same technique on some bookshelves for a revamp for a friend and then did a dark gray glaze and they also have that Aidan Gray furniture look. I reduced the spackle to a little less than half and I used a brush with thick bristles and swiped the plaster on! You would love it! I’ll get some pictures and add them to the post and let you know when I do! Thanks again Amanda! Unbelievable revamp of the tiger mirror. Incredible. Great job! thanks for the tutorial. Oh what an awesome transformation!! I’m sitting here looking around & thinking of the items I can use your process on!! 🙂 Thank-you for a wonderful, very thorough tutorial, too!! I’m excited…running off to Lowe’s for some spackle (& hoping I don’t screw something up!). Blessings! Thank you for sharing a clear and thorough tutuorial! 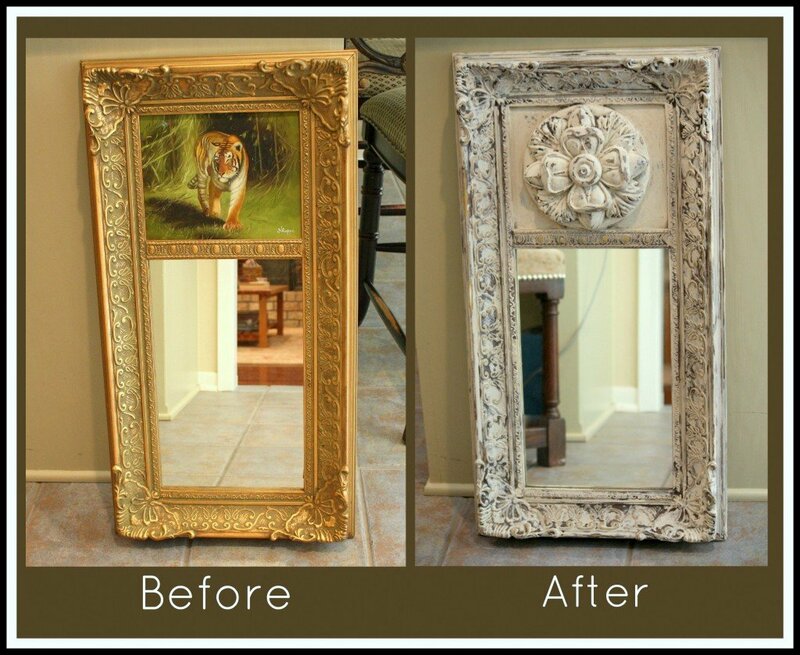 Great “tiger” piece transformation! Thank you Kathryn! 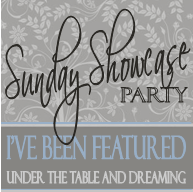 I’m so glad you stopped by and I would love to share at your Make it Pretty Party tomorrow! Thank you again! You are brilliant!! This post could not of come at a better time as I just found a pair of lamps at an estate sale that I wanted to give the Aidan Gray look!! Thank you from the bottom of my heart for sharing this tutorial!! Thank you Deb!! I’m thrilled that you like the technique and so glad that you can use it! Please, please send my pics when you are finished! I would love to see them. Let me know if you run into any problems or have any questions too! Good luck and that you for your sweet note Deb! Cheers! Oh wow, this is just what I want for around my chandy in the ceiling! Everything you’ve turned into treasure, it sure is! Great things. Wow! What an amazing transformation! Thanks so much for the tutorial. I’m pinning this!! Thank you so much for sharing. I cannot believe before and afters! 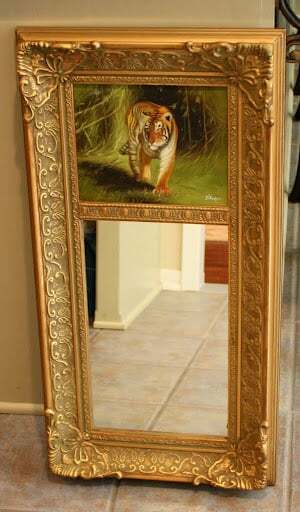 That tiger mirror….what a hoot! Loved your comment about taking it to Goodwill under the cover of darkness! I’m sure you’re glad you kept it….the transformation is amazing! Beautiful finish. You’re a woman after my own heart. Mixing concoctions is a true passion of mine. you did a fantastic job on this tutorial! thanks so much for such a well written post. I love love love the faux plaster finish. I have to add this to my want list. I love the medallion you have added to your mirror, but can never find them anywhere around where I live. Do you mind sharing where you found such a jewel? Thank you Linda! 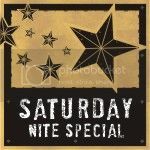 I purchased a bunch of them in different sizes and finishes at Hobby Lobby. You may be able to order them online at Home Decorators catalog. Thank you again for stopping by! Cant wait to try this!! Im in a mtg at work and went on Pinterest cuz it was boring. Couldnt stop reading this post!! Its torture I need to go home and start working on this!! 🙂 Anywho…what do you mean by ‘cheap primer’? thanks!!! buy the most inexpensive primer available. The cheaper the primer, the chalkier it is. Have fun with this treatment Jennifer and thank you so much for stopping by!! 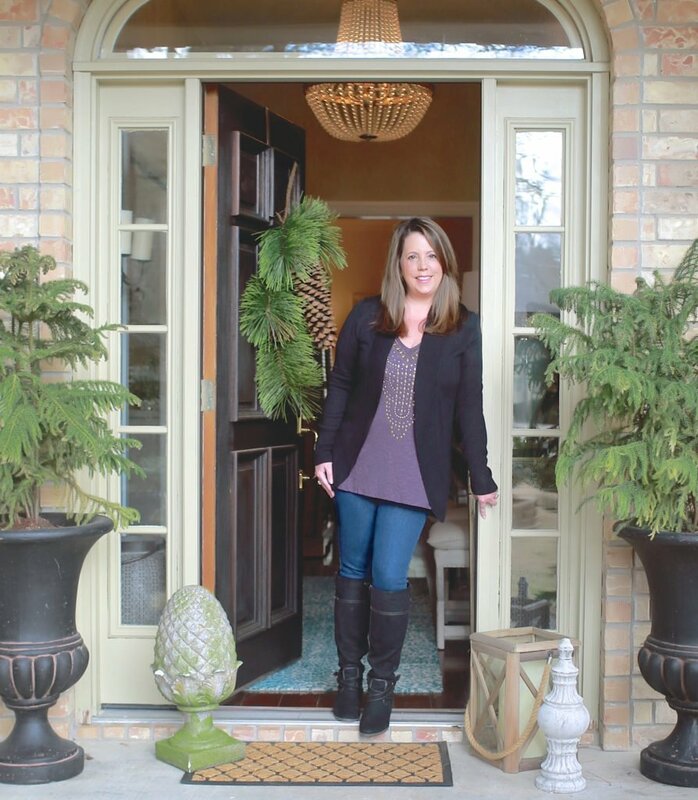 Cyndy, Always love your posts and project ideas – so inspiring! 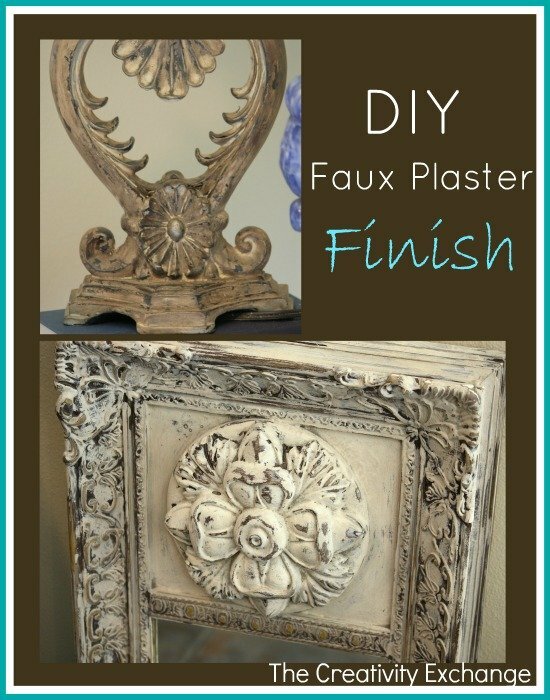 The faux-plaster paint finish is such a useful technique to know and use for so many parts and pieces in decor/wall trim. Great pictures too. Bless you for this. I have two stunning old world lamps that I inherited and did not want to throw away. However, I was at a loss as to how to repair/restore them. Your website it truly a blessing. I will post again and let you know how they turn out. Cheers! Thank you so much RObby for your kind words. I’m glad that you can use this tutorial, it’s one of my favorite techniques! Thanks again for stopping by! Hi, loved this post! I have been searching for this kind of ‘do it myself’ painting. 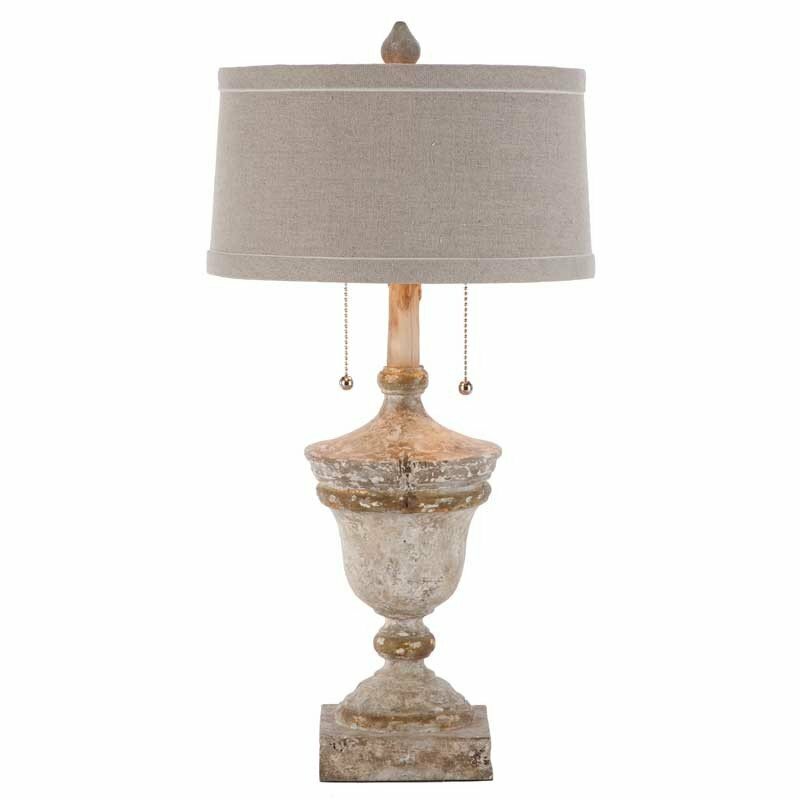 What color of glaze did you use on the lamp? It’s gorgeous! The mirror is wonderful also! I have a plastic medallion. Can this technique work? Would this technique work on the large faux pumpkins used as decor at Halloween? I have a bunch of them which have become scratched and banged up, and would like to change up my fall decor a bit. Hi Jeudi! Yes, pumpkins would be perfect for faux plaster. I love that idea. Just to be safe, I would prime the pumpkins first to make sure the plaster adheres. Sounds so fun! Hi! Amazing tutorial! 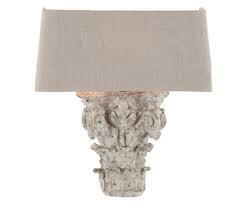 I am using your DIY info to update two lamps as we speak. They were a mess, but I have them primed and painted with the dark undercoat. I am just hoping that they will turn out half a beautiful as yours. I have one question. Do you use any type of sealer on your projects when you are through? If not, do they hold up to dusting and cleaning afterward? Thank you again for this tutorial. I am so excited to start the next step. I’m wondering if the technique might work on walls to give a plaster finish? Maybe go a little lighter on the spackle?